June 15, 2015|Posted in: Happy, Healthy, Smart Kids! Loving parents don’t wnat their kids to be upset, that’s a given. 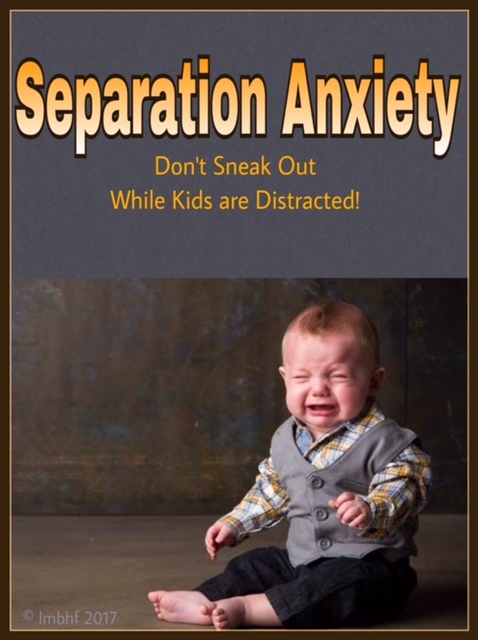 Lots of kids have separation anxiety, so I guess that’s the reason so many parents who are leaving their children with a sitter sneak out when the little ones aren’t looking. Sometimes we forget there that just because we can’t see them, doesn’t mean that they aren’t upset. Inevitably your little one will discover you are gone and become upset when they realize it. You won’t be there to see them upset, or to see them cry. So you might feel better, but will your child? All of a sudden they realize you’re gone and you didn’t tell them it would be alright, or that you would come back and that can make them feel abandoned or betrayed. In over twenty years of childcare I’ve seen many parents do it and it never works out well. To help your child with separation anxiety, the right thing to do is to tell your child you’re leaving and that the babysitter is going to care for them while you are gone. Tell them you will be back soon. Even if your baby is too young to completely understand your words, they may pick up on a few words and they will definately understand the meaning conveyed by your manner and tone of voice. Kiss and hug them and tell them they will be alright. Don’t prolong the goodbye process or try to sooth them repeatedly or for an extended period of time. If your child gets upset it’s acceptable to tell them one more time that you will be back and they will be alright. Give one more hug and then leave right away. Your calmness and matter of fact manner will reassure your little one that the things you have told them are true and help them feel more confident. If you sneak away while your little one is distracted it will increase their fears and anxiety. It can cause feelings of mistrust. They may worry that you will just disappear without warning at any given moment. Your words are golden to your children, especially if you are always honest. Your promise to return and your expression of confidence in their well being will be a great encouragement to them. Life is often difficult and we all have to do hard things. It’s important to help your child learn to face their fears and do hard things while they’re young and have you to help them. It’s something they’ll have to do all their lives and the sooner they learn to do it the happier they will be. 1. Tell your child you have to leave for awhile and who will be caring for them while you are gone. 2. Tell them you will be back soon. 3. Assure them they will be alright. 4. Give hugs and kisses (only a couple). 5. If your child is very upset repeat steps 2,3 and 4 – ONLY ONCE! Don’t prolong the goodbye. 6. Give them the opportunity to wave goodbye. This process is honestly the best way to spare your child’s feelings. Just like your child must be brave while you are away, you must be brave enough to give your the proper goodbye they deserve (even if it involves a few tears)! Your child will learn confidence, trust and how to be brave and do hard things. They will be able to be proud of themselves for being brave and doing something hard. When you return mention to your child how all the things you told them were true. They were ok while you were gone, and you did come back. Let your child know you are very proud of them. Leaving an upset child with the babysitter is one of the hard things many parents have to do. Be brave and focus on your little one’s feelings rather than your own. It might be difficult, but you’ll be glad you did! You might also enjoy reading Earning Your Children’s Trust. I agree, but sometimes it depends on the child. I used to work at a daycare and some kids do better when their parents sneak out and then the sitters can reassure them that they come back. I find that when parents linger and make a huge deal out of goodbyes it can be tougher at times. I know for my daughter I have to sneak out a few times or she will have a massive meltdown. When I do say goodbye and try to make it less of a big deal so she doesn’t have time to freak out. She is only 2 years old though. Michelle you’re right, making a big deal out of goodbyes isn’t a good idea. Simple and to the point works much better! I realize we’ve been inadvertently doing this with my youngest. We didn’t know he couldn’t hear very well until recently so we always tried to call him, wave to him, etc, but thought he was totally engrossed in the fun going on around him. Stacy, It’s good that you know that now so that you can help him, not just with separations, but with many other things as well! Great advice. Sneaking out will definitely prolong any anxiety or mistrust your toddler has about being separated! This is so right! I admit I did sneak out once, and my daughter was so distressed I never did it again. Nowadays, we explain to her where we are going, and how long we will be gone for, and sing the ‘grown ups come back’ song (thank you Daniel Tiger) – and at two, she is quite happy to go with it 🙂 Even if she gets upset, she sings the song and calms herself down. Great tips, thanks for sharing! Donna, your daughter is blessed! My daughters had a read along book with a recording of the song “My Mommy Comes Back!” I sing the song to kids all the time now. So glad that I read your post! I’ll be taking my 16 month year old to a nursery at our church here in a few months and have been wondering how to go about it, because I don’t think he will be very happy! I thinks it is so important to talk to children, even if we think they don’t understand it. I am amazed at how much my boys pick up. All good points you make here! Thank you Lori for sharing this post and co-hosting at the #BloggingGrandmothersLinkParty. I shared it on social media. Good advice. Thank you for sharing at the #BloggingGrandmothersLinkParty. I have shared on social media.